I’m not a visual artist myself, so I, like Magdalea, had to do a lot of research. With Florine Stettheimer, Gwen John and Tamara de Lempicka, I poured over portraits, studying brush strokes, chin lines and the proportion of parts. With the Jennys—Saville and Holzer—I poured over attitude, extremity and exhibition. With Cindy Sherman, I fell back in love with the still. And of course, the French performance artist Orlan and the feminist exhibitionist Valie Export have long been my favorites, especially when exploring the “cosmetic undoing” of Magdalena. Looking for physical documents of the “how” and “where” of Los Angeles, I went “old school” and used a lot of maps. While mapping Magdalena’s body (and bodily movement) across the terrain of Los Angeles proper I was also able to map her psychological condition and her physical healing. So you can imagine my intense JOY when I discovered, just last week, the insanely brilliant work of Arzu Arda Kosar. 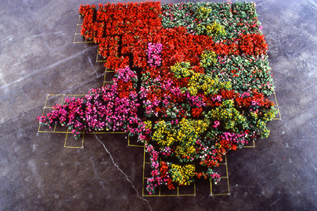 Featured in the current exhibit RE:Present L.A. (at the Vincent Price Art Museum until July 27, 2012) Arzu Arda Kosar work, LA Count Potted, features a mapped installation wherein the soci-economic and ethnic diversity of Los Angeles is plotted (and potted) with flowers.